Perkins + Will have designed the offices of ad agency Martin Williams, located in Minneapolis, Minnesota. Martin Williams (MW) is an advertising agency comprised of highly creative and diversely talented individuals aiming to communicate not only what their clients sell, but also what they stand for. The design team knew that the brand story of MW needed to be told and was charged with creating something bold, brave, and unexpected. Moving from a multi-storied location to a single floor plate, MW needed to think differently about how they work. The new office was planned with principles of mobility in mind; employees armed with laptops, custom MW beats, and branded backpacks. Every surface is writable, tackable, or houses technology. To improve project delivery, a wall of monitors adjacent to project managers, referred to as “Grand Central Station”, displays the constantly evolving project and staff list. Workstations are minimized to provide room for collaborative booths, small and large huddle rooms, and standing height counters along the perimeter. 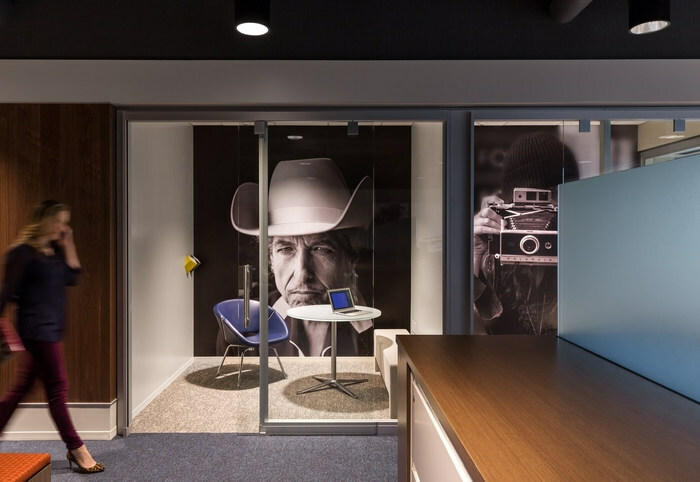 Huddle rooms feature over-sized graphics of creative vanguards from Bob Dylan to Maya Angelou. Aside from the pitch room, meeting rooms are laid out like living rooms to foster collaboration, each taking on a unique character and filled with objects to inspire the creative workforce and pay homage to MW’s past.